We get it: no matter how carefully you organise your space, there comes a time when you take a look at your living room furniture and go: Why does it look so cramped? At IKEA, we believe simplicity and function are the key elements when it comes to home décor. However – especially with large families – keeping things simple will take some effort. But don’t worry: here are some simple furniture and storage hacks you can use to make any room look less cramped! Just like with horizontal stripes on shirts, arranging everything horizontally in your living room can give you a feeling that the space is too cluttered or cramped. There’s one simple hack to avoid this: go vertical! Instead of extending shelves and racks horizontally against a wall, why not go vertical with for some of IKEA’s upright wall shelves and shelving units? These can be used in a variety of different ways: as a bookcase, a photograph section, a place to display your objets d’art, or even to hold plants! Go crazy and use up the height of your room instead of layering things horizontally! Ever entered an elevator and felt it looks much bigger than what it actually is? Do you know it’s all because of that huge mirror? It simply reflects the space in front of it, making you feel like there’s double that space available! And this same trick will work wonders for your living room as well! Just remove the idea from your head that mirrors are only for the bedroom and bathroom: IKEA has a stunning range of mirrors for you to choose from, in all different shapes and sizes. Some of them can even double as art pieces – whether you want them ornate or minimalist, we’ve got it all. Another way to completely change the look of a space is to cleverly use textiles for texture. At IKEA, we have a huge textile collection, including curtains, carpets, rugs, throws, pillow and cushion covers and cases. Use these to add a startling touch of colour to the floor, seating spaces and walls of your living room. This will catch the eye immediately and make you feel there’s a lot more going on without much effort or taking up too much space. 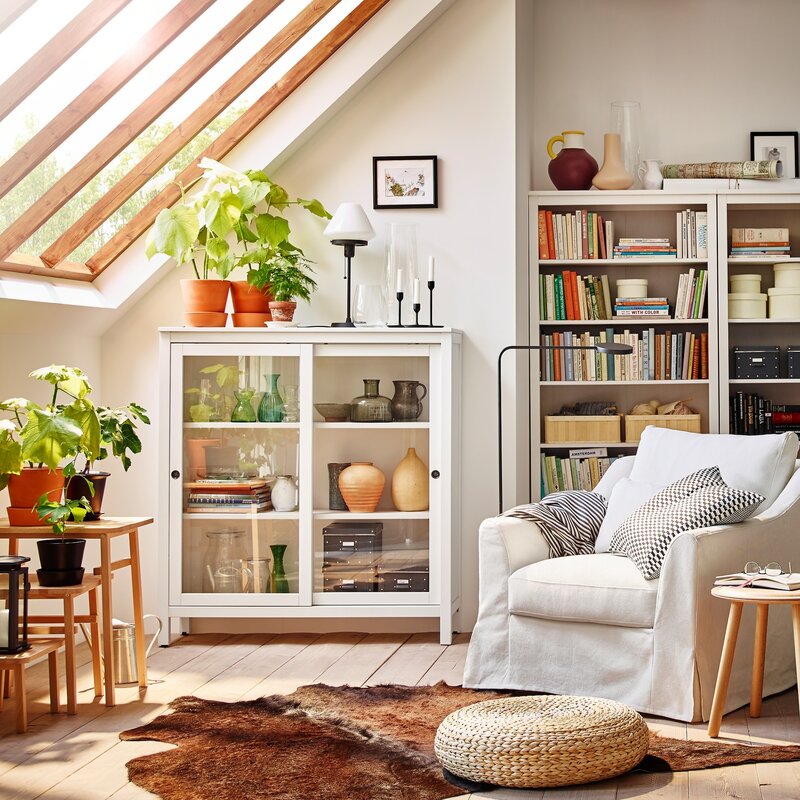 So, go ahead, explore IKEA’s stunning options and make your living room work for you – no more cluttered spaces!